Google <your city> <your state> and <down payment assistance> to see what your local government has on offer, and what it takes to qualify. Borrow it from yourself! If you have a 401K or Roth IRA account and some years to go before retirement, you might be able to tap into it or even borrow against your own funds for your down payment. Currently, you can take up to $10,000 out of your Roth IRA with no penalty to put toward the purchase of your first home. And while you can’t similarly draw from your 401K, many retirement and pension plans will allow you to borrow the money against your funds, then repay it to yourself – at interest. 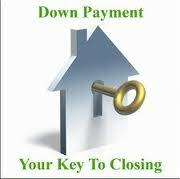 Hmmmm, pay your lender back with interest, or pay interest to yourself – choose you! But first, get some advice from your CPA or financial planner.